While browsing the National Library of Australia site I revisited their collection of free ebooks. These titles are all PDF so can be read on any device. I saved some titles direct to my Calibre ebook library where I can convert them to other formats or simply load them on to my Kindle and have the convenience of reading them at my leisure. Here's just a small selection of titles relating to life in colonial times that I found to be of interest. The World Upside Down: Australia 1788-1830 draws on the National Library of Australia’s collections to explore some of the many fascinating aspects of life and art in colonial Australia. Jane Franklin's diary provides a detailed and colourful snapshot of colonial society, recorded by a sharply observant witness. An intrepid traveller, Jane Franklin was consumed by an unquenchable curiosity. She looked, questioned, listened and wrote—pages and pages of miniscule notes on every topic that came to hand. W.H. Corkhill (1846-1936) documented many aspects of the inhabitants of the tiny twin settlements of Tilba Tilba and Central Tilba,on the south coast of New South Wales— farming, gold mining, shipbuilding and road making — and their rich and varied social life. His rapport with his sitters draws the observer into their world. Governors' Wives in Colonial Australia explores how five viceregal women—Eliza Darling, Jane Franklin, Mary Anne Broome, Elizabeth Loch and Audrey Tennyson—fulfilled their role. Drawing on letters, diaries and journals, Governors' Wives in Colonial Australia provides an account of the role of viceregal women in colonial life. In 1971 the National Library of Australia was given some 900 glass negatives of Gundagai. Of the collection found by chance, 120 selected plates are reproduced in this book. The photographs were taken at the turn of the century and are believed to be the work of Charles Louis Gabriel, a doctor who added an exotic French flavour to that loyal bastion of the British Empire, Gundagai. I hope you find something to enjoy from the NLA's collection. User Guides or Manuals have vital information about the operation of your phone or tablet. Unlike the quick guide that was in the box with your phone or tablet, these user guides provide in depth information. They can usually be found on the manufacturer's site under Support. There are interactive guides, PDF manuals, static web pages and in some cases ebooks. It is a good idea to download a user guide to your device to have quick access to the information while you learn to use your device to its full potential. Bookmark the page in your web browser where the interactive guides are located for future reference. Many guides/manuals on manufacturers' websites are often PDFs, so make sure you have a PDF reader on your device. 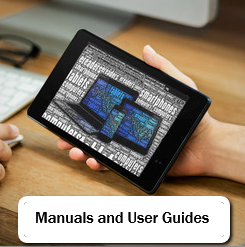 On some tablets and phones, the manual will download to My Files or Downloads, on others you will be asked which app you want to use to read the manual. Telstra mobile support provides interactive guides for a wide range of phones and tablets. 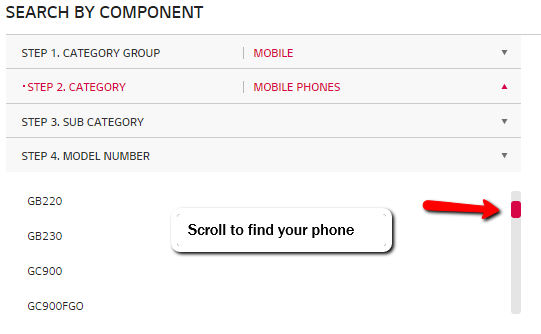 Optus also provide specific device help with screenshots showing exactly where to find a range of functions. You do not need to be a Telstra or Optus customer to view these support pages. To identify your device, go to Settings and scroll right to the bottom where you will find About Phone/Tablet. In some brands you will be able to locate this information under Settings, Device. The Android Quick Start Guide is free on Google Books. The Alcatel Support site offers a wide range of answers to questions but no User Guides or manuals are apparent. For HTC phones select Support then type in the name of your phone and press enter. Scroll down below Accessories to find the User Manual. Huawei manuals for both phone and tablets are available from the Support site. Be sure to choose the User Guide rather than the Quick Start guide which was packaged with your product. LG Manuals are all together and easy to locate by following the on screen prompts. Choose Category Group >Mobile > Mobile phones. A long series of model numbers is then revealed and the User Manual for each model is listed immediately below it under the heading Manuals and Documents. Motorola certainly wins the prize here for making it easy to locate your product. They have excellent support pages with manuals for all their phones. If you do not know the name or model of your phone there is a guide to help you get to the right phone or tablet and its manual. here are some quick link to well known products. Samsung guides can be confusing to locate as there are such a wide range of models available. .
Next choose Smart Phone or Tablet. Now you will be directed to make a model choice. The screen that delivers your model has a wide range of help topics but scroll down to the bottom of the screen to find the correct User Manual. The Sony support site has excellent interactive guides and PDF manuals for both phones and tablets. The best method to obtain the Apple user guide for your device is through the free iBooks app. If you do not have iBooks on your device, visit the App store and download it. There are also plenty of other free tips and tricks guides in the iBooks store. Nokia phones are now using the Windows interface. The Nokia Support page lists the phone models. choose your model and most User Guides will be listed immediately underneath the picture of the phone. The Windows Phone support site is available where no manual is provided. What a rewarding experience I have had over four weeks. The regular family history/genealogy volunteer guru in our local library has been away enjoying a holiday break. 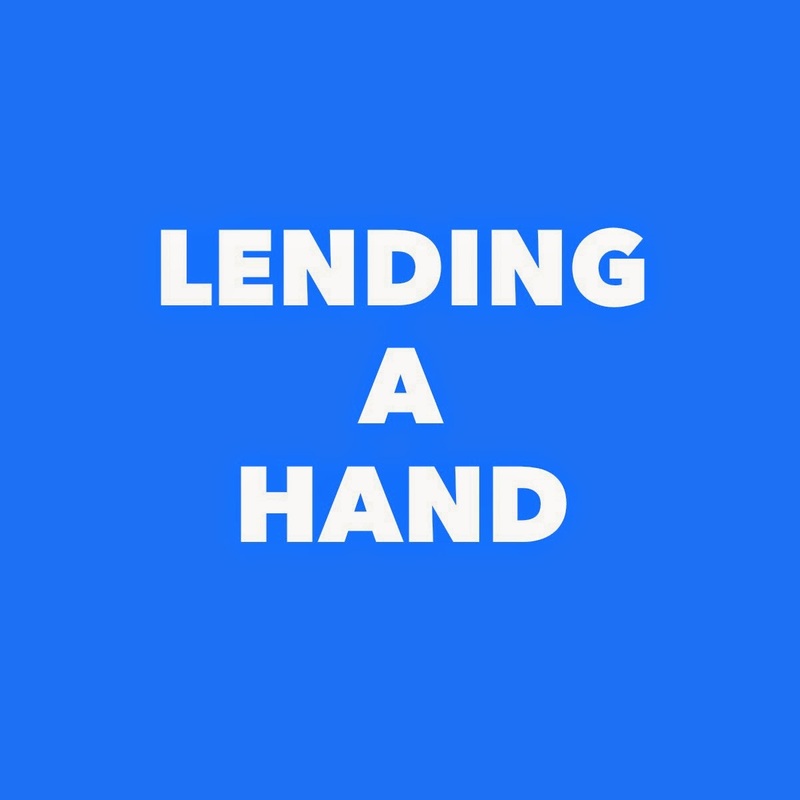 When the call came for volunteers to fill his 3 hour spot each Friday morning, I hesitantly offered my time not knowing whether I had enough genealogical expertise to be of assistance. Since then I've heard some heart-breaking stories and shared some delightful finds. It has been my privilege to assist. Here are a few highlights. Case 1. A baby adopted out during difficult times in WWII in England now in her 70s was very pleased when we found the records of the births (with names) of two previously unidentified older siblings and her birth mother's death record. Case 2. Trove came up trumps for a local seeking help to find details about a great grandfather involved in gold mining near Gympie, Queensland. Case 3. The Discovering Anzacs site provided additional information for a woman who had with her a treasured World War I diary that belonged to her husband's father. Yes, the WWI veteran had a son at age 58. What a privilege it was to see that small diary written in beautiful script 100 years ago on some of the worst battlefields of the Western Front and to have the opportunity to provide some suggestions about conservation and digitisation. Case 4. I knew nothing about PQ 17 a World War II convoy in the Arctic but was able to help the owner who had her father's original documents from his time on one of the ships in the ill-fated convoy. She was looking for a suitable home for the documents, so a simple Google search has provided her with appropriate contacts where she can obtain professional advice from either the Imperial War Museum or National Archives, Kew. She is now looking forward to reading a variety of Internet articles with information about the convoy and intending to watch this BBC produced Jeremy Clarkson documentary. Those of us with computer skills need to remember there are so many folks, not just seniors, who still do not have the confidence or skills to find the information they seek. Volunteering brings its own rewards. Do not hesitate to share what you know. 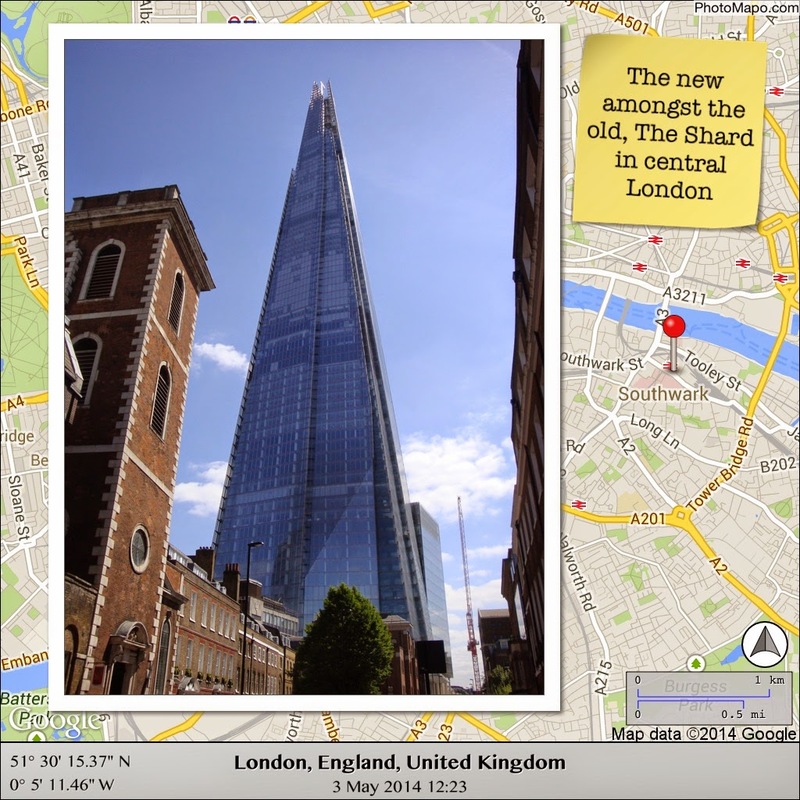 The Photo Mapo app available for iPad and iPhone adds maps as a background for your photos. A description of 180 characters can be added to give context to the event or photo. 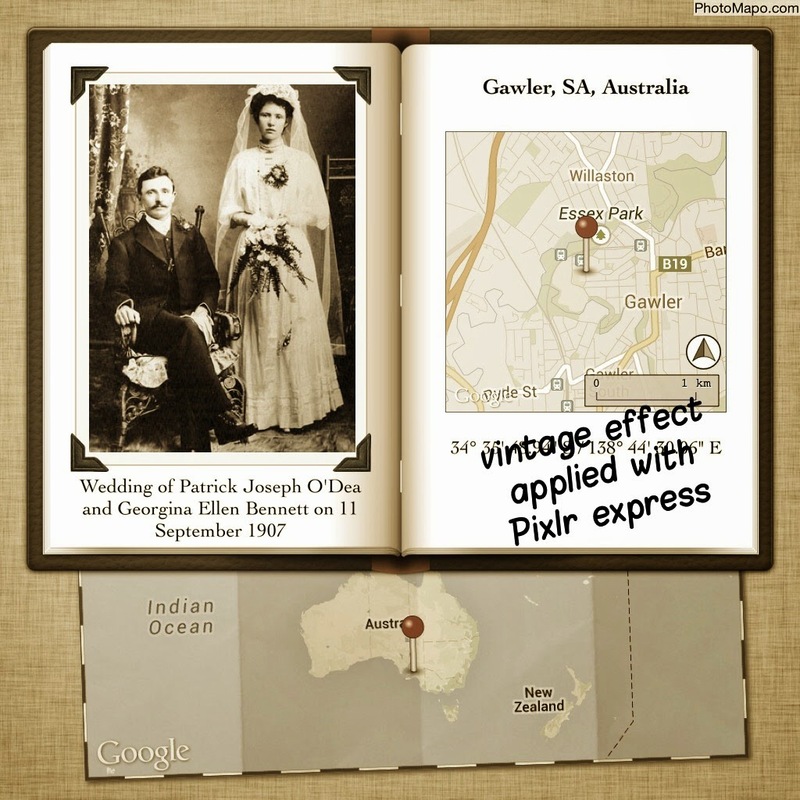 This is a great tool to use for your holiday snaps. The map location is found by the app if location services were turned on when the photo was taken. If not, one can simply search for the location and the data is added. In the app settings one can choose how much detail, metadata, is added to the map. Recently I've been experimenting with some historical images. 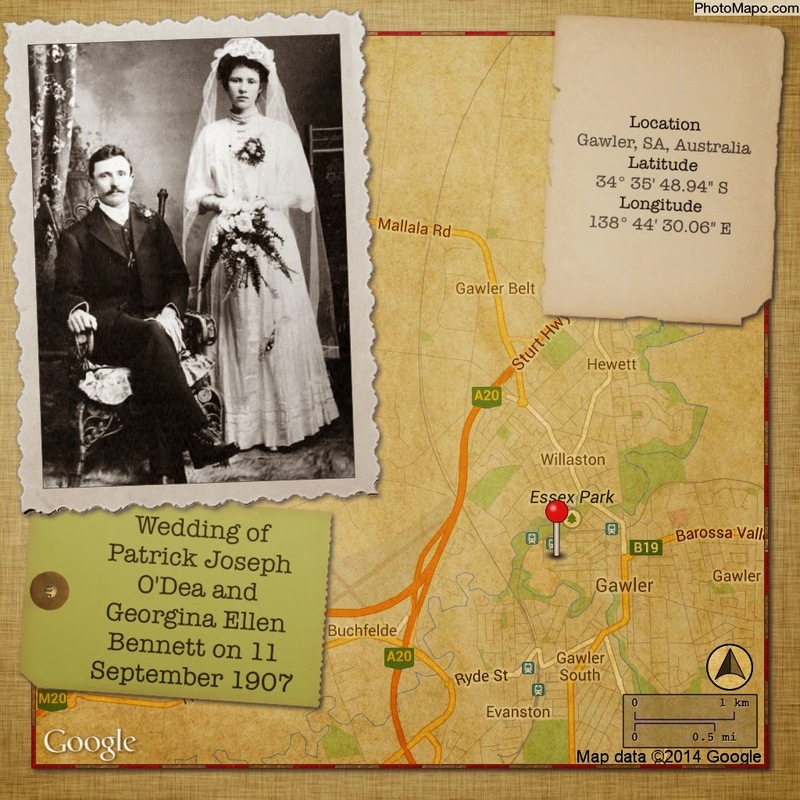 Here are three of the many layout variations available within the app using the 1907 wedding photo of my grandparents. 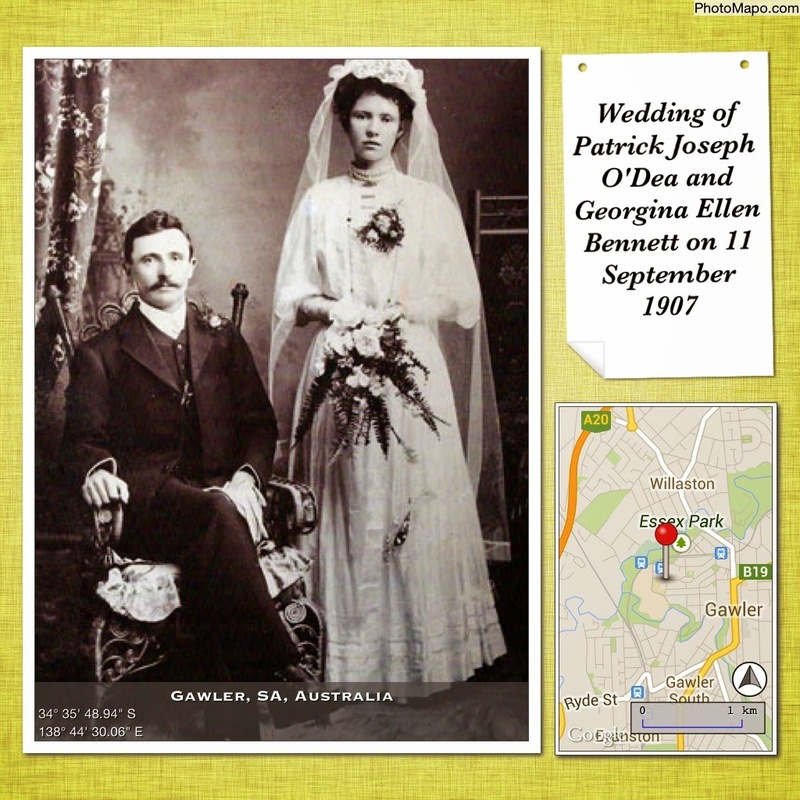 I searched for the exact location of the church in which they were married then added the description for the photo. In this case there is no time detail added to the map. The location of the church was pinpointed exactly even though the surrounding town has now changed so much in the ensuing 107 years. In this final example I saved the image from Photo Mapo then opened it in Pixlr Express - available as mobile app or on web - to add the vintage effect as a more suitable match for the photo. 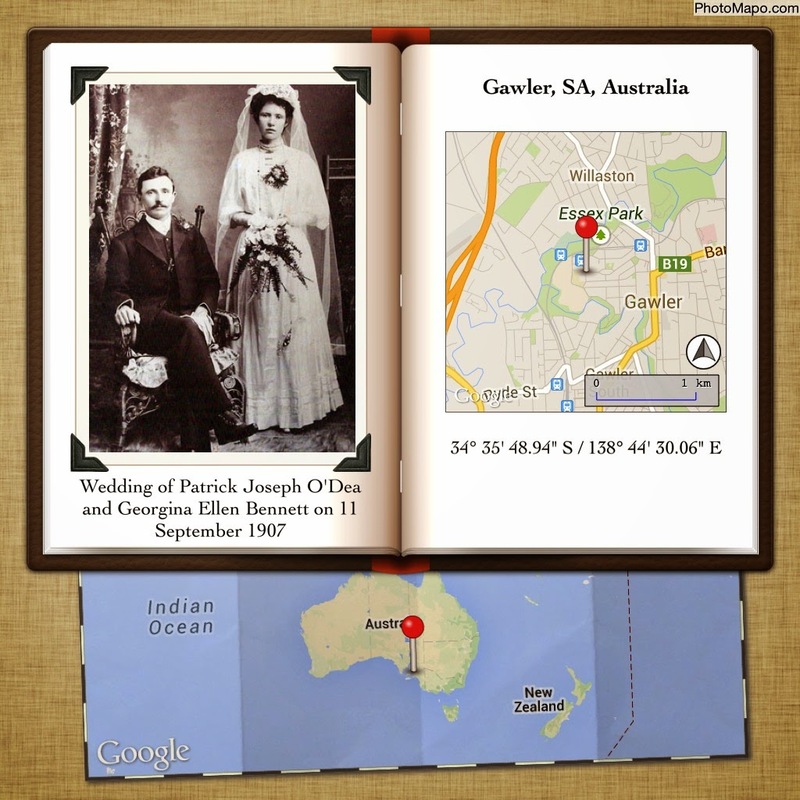 If you do not have access to a map of a particular area in the era you need, this is one way to give your family pictures geographical context for your family history blog or book.